But first I have to say that it is so much fun to get to experiment with foods that other cultures have been using for hundreds of years! And if you don’t have any curiosity about the food you’ve never tried, please find some! Otherwise, how will your children see the open-minded model you need them to see so that they will be open to trying Brussels sprouts and kale chips and asparagus? I remember tasting Greek food for the first time in a basement restaurant in Boston. It blew my taste buds away! And the flavors in Thai food…I had never had those combinations of food and spices in my mouth at the same time. It is an awesome experience to wake up your mouth to something new! 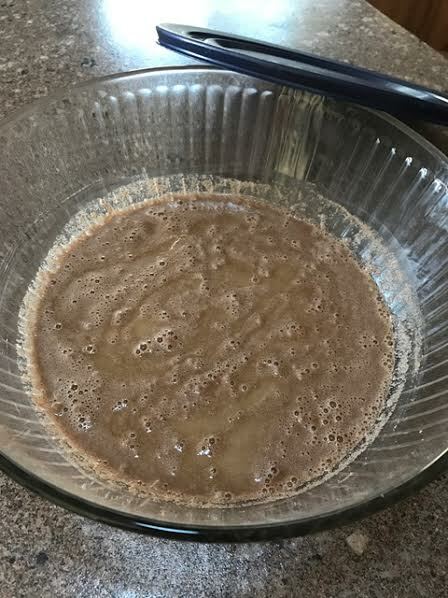 Onto teff….This is a picture of teff flour, (1 1/2 cups) mixed with water, (2 cups) that is prepping for 24 hours to become injera, a flat bread from Ethiopia. It is super easy to make and there are no known allergens to it. It is a great source of minerals, amino acids, and makes a very versatile flatbread. I’m excited to be experimenting with it! After you soak the flour overnight or up to 24 hours, you’ll have the base for a spongy, little-bit sour flatbread. Then you add 1/4 tsp salt and 1/2 tsp baking powder. Pour the batter into a hot, (medium hot) greased skillet, cover with a lid and let it cook for 5-7 minutes. Since it is covered it will steam a little, so you don’t flip it over. The texture should be somewhere between a crepe and a pancake. Cook all of the batter, putting each “wrap” on a plate when it is cooked. Since I have a hard time with gluten, I am always looking for something “bread-ish” to eat, and I’m in love with injera because it is simple, traditional and nutritious! I’d love to hear how you use this flatbread if you decide to try it. I’ll keep you posted on my experiments too! Here’s to branching out and being curious about the world of food!